I have always LOVED Drew Barrymore. Ever since ET, from50 first Dates (One of my personal faves!) to Grey Gardens. Oh! And who can forget The Wedding Singer? I love the characters she portrays and I love her wild child/ flower child appeal. Her style, however, sometimes leaves something to be desired. However, I am in LOVE with this shoot. She looks amazing. I will go as far to say this might be the best she has ever looked! Her hair has got it GOING on. She's embracing the whole Ombre hair style that's ever so popular right now! I totally agree. Her hair and make-up is flawless, but I'm a sucker for the 60s bombshell glamour. I have this issue and my husband did not believe it was her. He had to study it for a minute until he agreed with me, haha. She looks incredible, especially in that cutout dress! She looks smoking hot! I love Drew! wow, great minds think alike, again. wait until u see my next blog post. She is so Fabulous! Belle Du Jour.... I would love to see FOTD from you since you don't do Youtube vidoes anymore. wow, she is normally not one of my favs but I do agree with you here, she looks stunning! She looks amazing in these photos. 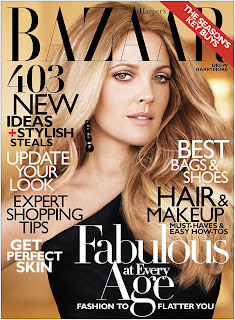 Is it my imagination she looks a bit like Celine Dion (eyes) on the cover photo? I loved her and her style in Music and Lyrics. Stunning, love the pic with the strapless dress on her! I bought this the other day since I am obsessed with Drew as well. She is just amazing and positive. I almost passed out when I saw her in that midriff baring dress. She looks amazing! She in that cutout dress and green dress is just utterly beautiful. I love Drew Barrymore (hers are the only romantic comedies that I allow myself to watch) and she looks stuning in these pictures but I have to say that her hair is not that long right now so it's probably extensions. I love Drew, she looks absolutely freaking gorgeous. This was such a good issue! I love Drew! The last two pictures are my personal fav. She seems so down to earth....but of course she looks smokin' hot. I agree! She looks amazing! I just want to say, i totally get why you quit youtube, the bitchiness and haters on there is totally ridiculous, but i sure do miss your videos!! she does look really good! Agreed - I have always been a fan of her more than her movies. Don't get me wrong - she's made some great and not so good but she's always been so loveable. She's one of those actresses that you wish was your BFF.